Dublin Sketchers were at the National Print Museum at Beggars Bush Barracks last Sunday. It was my first time there and I had a ball! The lady who was in charge on the day was really nice. They have an amazing collection of printing presses. A good exhibition. And a nice café. I chose to draw a Wharfedale press. Well, only a very small piece of it, actually. The machine is enormous, and I wouldn't have had anywhere I could have drawn it from to capture the whole thing. Plus I probably wouldn't have been able to fit it on the page. And I would have run out of time. It took me two hours to do this piece of it! I started with pencil to get a sense of the proportions, but then when I started working in pen, I realised I was way off and re-adjusted the drawing accordingly. When I felt I had all the detail I wanted in place, I used a water-brush to tickle the ink and create my greys. A cup of green tea and a slice of carrot cake, and a chat with a few talented newbies, rounded off the afternoon nicely. PS: did you know that the Irish Declaration of Independence, Easter 1916, was printed on a Wharfedale press? Another great outing with Dublin Sketchers. It was my first time properly sketching in Powerscourt Townhouse (I had done a quick half-finished sketch there a few weeks ago). I found a great spot. But even with two hours, I did run out of time. The drawing was a bit more ambitious than I had anticipated. I had to start in pencil to make sure the proportions were credible at least. Then pen. Then watercolour. I might still paint the rest of the brick wall, which looks a bit sad and patchy for now. And I might add some colour to the windows. But I am happy with the overall look of the page. All back to normality now. But the memories of Venice and Inis Oírr will carry me through the rest of the winter. Plus the joy of seeing life reappearing in the gardens and parks of our neighbourhood! All watercolour sketches below done in Moleskine watercolour sketchbooks (one more or less A4 landscape format and the other a smaller landscape format). Glad I brought my bulldog clips to stop the pages from flapping in the wind! I found these videos useful in figuring out how to paint water. Now I just need to remember to do it! This poem by Seamus Heaney really captures the way I was feeling while on Inis Oírr! Thanks to Stephen for introducing me to this wonderful poem. Seamus Heaney - Postscript from Éamon Little - LittleVision on Vimeo. Loved the Aer Aran service from Inverin (just beyond Spiddal) to Inis Oírr. €49 return, free car park in Inverin. Very professional service. 8-9-seater planes. And if you love flying, this is such a treat!! A short (7 minutes) but beautiful flight. And on the way back, you might even land on Inis Meáin to pick up a few extra passengers. And if you're even luckier, your pilot will be notified just after takeoff from Inis Oírr that they have a late arrival at the airport and you'll have to go back to pick them up, offering you the best view of the island, with the Plassey wreck and the lighthouse as bonuses! And then, you might fly into a shower! What an exciting half hour it was! But my intention wasn't to talk about a movie (it's a few years old). But about watercolours. And no, being on the obsessive side of the spectrum is not something new for me. I just wanted to say that sometimes, in watercolours as in any craft, you experience a eureka moment, a breakthrough. I was struggling with a painting earlier this week, as you know. But I've been reading a book on watercolour that I received as a Christmas present. The kind of book that I probably would not have found useful a year ago - I would have found the concepts too advanced for me. Well maybe not advanced, but too abstract maybe. And now it's my new bible. (Watercolor Painting, A Comprehensive Approach to Mastering the Medium, Tom Hoffman) I've just finished the chapter about the relative wetness of the paper and brush! And one of the recommended exercises was to take an old scrap painting and rewet an area of it that didn't really work and apply fresh pigment and see what happens. (This works best on lighter areas obviously). And here is the result - a painting I did on cheap paper a few weeks ago. It lacked oomph. Much better now. Oops - I forgot to take a picture. (or I can't find it in my 9000 files for Autumn/Winter 2016/17!) So you'll have to believe me - the grass was wishy-washy and the sky as so pale it was as if I had forgotten to paint it. PS: I had to google the line - it was Galaxy Quest! Did I mention I was stubborn? Forgetful and stubborn, that's not a good combination! Anyways - between my new bible on watercolours, Watercolor Painting, A Comprehensive Approach to Mastering the Medium, by Tom Hoffmann, and some useful videos on YouTube, I've made progress! So, after washing off the horrible heavy colour, I waited for the paper to dry thoroughly, then I rewetted the area I wanted to rework - the whole water area. I then dropped fairly thick pigment in various spots and let the water do the job. As you can still see the ghost image of what I washed off below this new glaze, you do get a fairly convincing shimmering water effect. I just need to rework the wooden pillars to make them more vibrant, and I'll be done then! And this time I remembered to take before and after photos! This is what it looked like after I washed off most of the paint off the paper - I had to use a toothbrush to get rid of as much of the high-staining phthalo pigment (the ugly ripples) as I could. After rewetting and applying fresh, juicy pigment. Who said you can't fix watercolours when they go wrong?? I've been struggling with this topic for as long as I've been painting in watercolours. Given the name, you'd think it would be easy to paint water. Not! 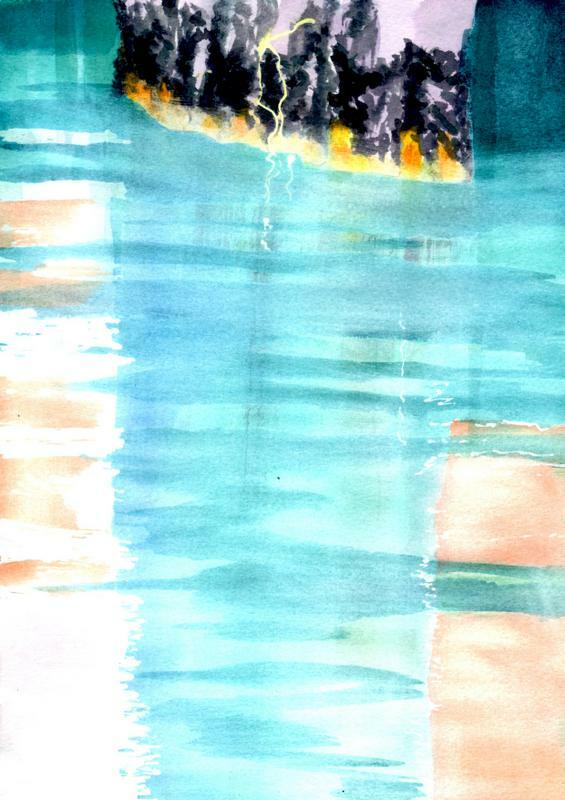 There is something about water scenes that keeps on evading me, particularly when it comes to ripple patterns. It's this mix of light and dark, vertical and horizontal. Should you use masking fluid? Should you work wet on wet or wet on dry? Should you work loose or carefully planned (although these two are not necessarily mutually exclusive)? How to keep the water transparent and the ripples dark? I've been searching the web, but I'm not finding any easy answer. It's all about the wetness of the paper and the paint, but how to do it? I'm not looking for a photorealistic effect, but I don't want it all blurry either. For me, I think the clue is in the fact that water is a fluid medium, and yet, the patterns on the surface of water are quite defined. So, maybe a transparent and light fluid first layer (wet-on-wet), followed by a darker pattern (wet-on-dry). My attempts so far haven't worked out. I've even run my latest attempt under the tap to get rid of most of the paint - plus I had to use a toothbrush to scrub off the phthalo turquoise, which is a staining pigment (left), and I might try one more layer to see what happens. Or just use the back of that paper for scrap! I need to spend more time with it. And keep trying. Although right now, I'm tempted to move on to something else! Clouds maybe? I don't buy or read many "book" books any more. I am more of a Kindle woman. I don't read half as much as I used to. Too many distractions. Social Media. Netflix. Time flies. But every Christmas, we go into Dubray book shop on Grafton street, and buy a couple of books. I know it's probably not enough, but I feel like we do our bit to keep bookshops open. 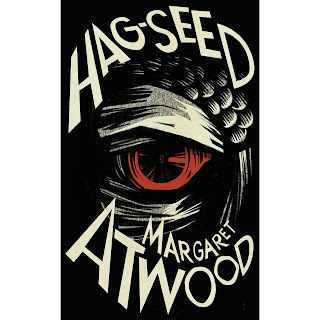 That's where I got Hag Seed by Margaret Atwood. It was a while since I read any of her stuff. I used to be a big fan, but I kind-of lost interest somewhere along the way. Hag Seed is a re-interpretation of Shakespeare's The Tempest. And what a trip it was! I've never read The Tempest. I've never even read any Shakespeare! But I had seen The Tempest as an opera. So the story of a theatre director who has been sacked and finds work in a prison worked for me. Just as in the play, a big injustice, plotting for revenge, lots of villains. And a daughter called Miranda. I loved it. I must go back and see what else Atwood has written in recent years! Inis Oírr (it used to be called Inisheer, or is that the other way round?) is a magical island. Particularly in February, when there are no tourists! Drunk on fresh air, I would rave about the skies and the seas and the walls. At least I have some photographic evidence for my madness. And for those crazy paintings I did. Small as it is, Inis Oírr boasts a lighthouse, a shipwreck, a castle in ruin, a buried church, a beautiful beach, an airport, two pubs, a hotel, a hostel and countless B&Bs. But all I cared about was the sky and the ocean. And the light, the light, the light! Glad I packed my thermals and waterproof gear! 3 nights. 2 days. 6 paintings. And tons of watercolour sketches. This was my first time trying plein air painting. And you can guess. I loved it. So much energy battling with the elements. Crouching against a wall, yellow rain poncho on, umbrella open, thermals, rain trousers, woollen mittens. Waiting for the rain to stop, so I could start painting the moment the shower passed, and be done before the next band of rain made land. These are not fine-tuned paintings. But I think they reflect the energy of the Atlantic Ocean, and my sense of euphoria as I mixed my colours and painted as if my life depended on it! I had a ball! And to finish with Venice, here are a few panoramic views (some are slightly distorted). My head is still full of pictures from Venice, now mixed with sensations and feelings from Inis Oírr. But I will leave you today with a couple of videos that sum up the Venice dream for me. Just imagine this was mid-summer, rather than mid-January! While reading about Venice, I came across this map from 1500, by Jacopo de Barbari! What is amazing about this map is that it records in detail every canal, every street, every palace, with great accuracy. And what's even more amazing is that Venice has not changed much since. For me, this map is the perfect explanation of why I got lost so many times through this most beautiful city. You think you're going North, and then you hit a canal without a bridge, and you have to take a turn, and then, you have no idea which direction you're facing. You know the Grand Canal was behind you when you started off. But by now, the Grand Canal has twisted 180 degrees, and all of a sudden, it's right in front of you. How is that even possible? And it's getting dark, so there is even less hope of finding your way back to your hotel... Well, that's when your iPhone Maps comes in handy. How did anyone ever manage before the iPhone? But the trick is to only use your tricorder, sorry, your iPhone, when you absolutely need it. Otherwise, you'll miss all the beauty around you, and you might even end up walking into a canal! Completist that I am, I have to show you the rest of our food photos from Venice. Some of them are a little dark as one of the restaurants had more of a romantic, candle-lit, theme going. Ciabatta at Bar da Gino in Dorsoduro. We didn't feel up to a big meal that evening. But we found that portions were more than generous in this lovely little place, which is open from 6 am to midnight, so you can start with coffee and a croissant, have lunch, say a ciabatta, a hot chocolate in the afternoon, then an early evening glass of wine before you have your pizza for dinner! The rest of the photos are all from a restaurant called La Calcina. It's also a hotel. And most of the patrons appeared to be French. None of the pictures below do justice to the food, which was absolutely gorgeous. A combination of low light and hunger meant that by the time we'd remember to take a photo, we had already taken a bite or two of our food! In the summer, they have a big terrace on the Guidecca canal, La Piscina - a lovely cool spot on a hot summer's day, I'd imagine. In the winter, the dining room was cosy and the service impeccable! Sometimes, you have to take the opportunities when you can. I was early for a meeting. So I sketched! Sometimes, you have an image in mind, and you can't shake it. No matter how many other beautiful scenes you see in the meantime. This was the case for this mountain view in Glenveagh National Park in Donegal. A majestic mountain sweeping down to the lake. From the moment I saw it (in 2013? ), I knew I would paint it some day. I just had to wait until I became more experienced in my watercolour practise to feel able to tackle it. Particularly so as I wanted to render it in an abstract way. The question now is "is it out of my system?". We'll have to see. But I have many other images rumbling in my head right now. So let's tackle them first. Impossible to go to Italy and not put on a little bit of weight! Every meal was a feast. We didn't even have pizza once. And dessert only twice (1 panacotta and 1 tiramisu, and we even forgot to photograph them!). We had a special request for photographs of our food. We did our best! Barely arrived, and eating like queens already. Cantinone Storico. A mixed starter, with polenta, octopus salad, cod purée and sardines, onion and pine nut salad (sarde in saor). With the bread, that would have done me for lunch! But I had already ordered a main course. Ah well! Aperitif - and that was only lunchtime. Great menu del giorno at Antica Sacrestia! Spaghetti pomodoro - yes that was a starter portion! Main course of Fritto Misto (fish, calamari, prawns). It came with the mixed vegetables too. At €20 a glass, we didn't do this everyday. But you have to try Harry's Bar's Bellinis once in your life!